In today’s digital age, some people may never even go into a public library. Never experience the awe of standing in a huge room filled with hundreds of books that go all the way up to the ceiling in some cases, and down long rows of shelves in others. I remember sitting on the floor in the corner of my public library as a child with A Wrinkle in Time in my hands, lost in the world Madeleine L’Engle created while I waited for my Mom to pick me up. The yellow brick building was just a block away from my grade school and sometimes when she was not able to meet me right as school let out, I would go there to wait instead. I could have waited for hours. The place held almost as much awesome holiness to me as the church I attended on Sundays. It was certainly filled with just as many mysteries. 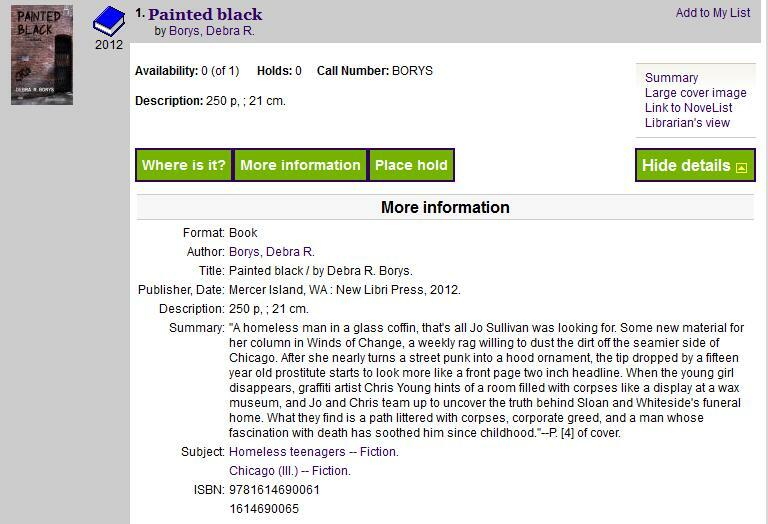 Today I found out a friend requested my novel Painted Black from their local library. Due to his initiative, his library system purchased a copy and told him it was ready to borrow. I know my book doesn’t approach the appeal and mystique of A Wrinkle In Time. But there is an intense satisfaction in knowing that somewhere within the walls of the Kitsap Public Library, someone could be sitting in a corner flipping through the pages of a novel that I’ve written. The thought fills me with as much pleasure as my first Madeleine L’Engle books did. If you want to read Painted Black, ask your local library if they have a copy. Or you can buy a copy of your own by asking at your local bookstore or going to Amazon.com. This entry was posted in News on Painted Black and tagged Painted Black by dborys. Bookmark the permalink. Awesome! And your friend’s library is better than our own (King County) where I requested a copy. What did King County say if anything? Did they even respond?